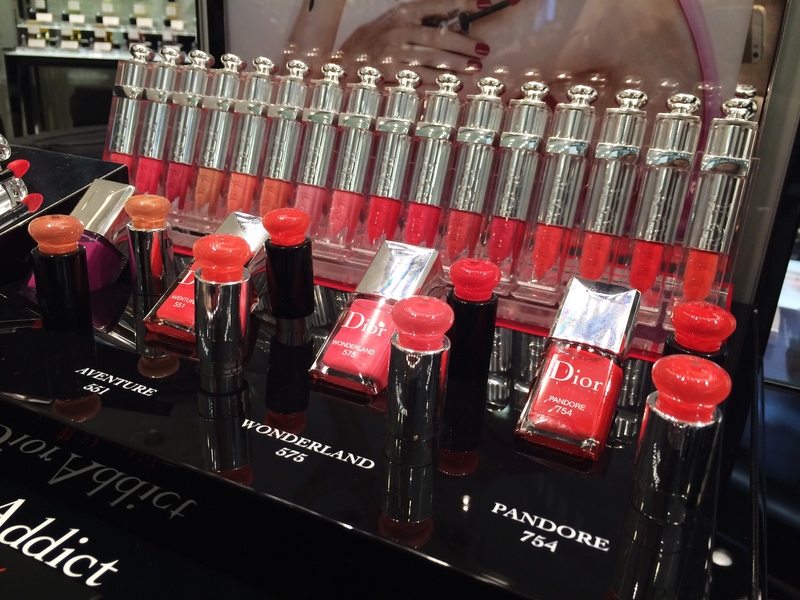 Liquid lipsticks are having a moment right now and first on the high end bandwagon is Dior going all the way with 16 shades of liquid goodness with their new Fluid Sticks. I had some serious difficulty picking shades as the variety was rather limited although there were a whole 16 to choose from. There were way too many corals and peaches but just one actual pink! How is that a balanced colour chart right? 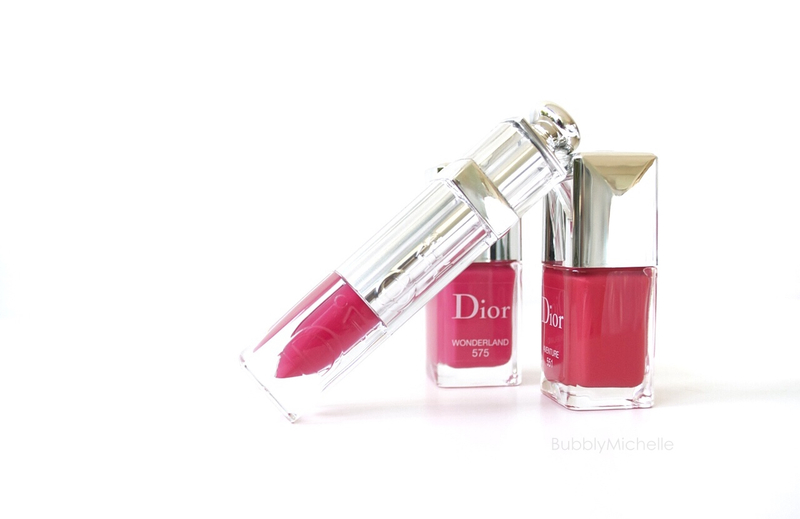 Anyways after swatching and swatching I finally settled for 575 Wonderland a strawberry red shade with a tinge of coral which was one of the 4 ‘It’ or must have shades listed by Dior. I also picked up two of the nail lacquers that came out with this, 551 Aventure and 575 Wonderland. 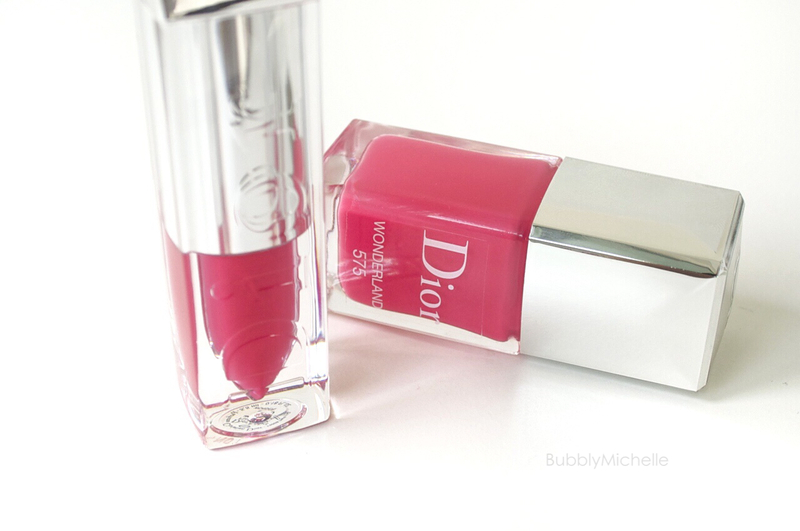 Today I am only going to review the Wonderland duo, Fluid Stick and nail polish. Let’s start with the Fluid Sticks! 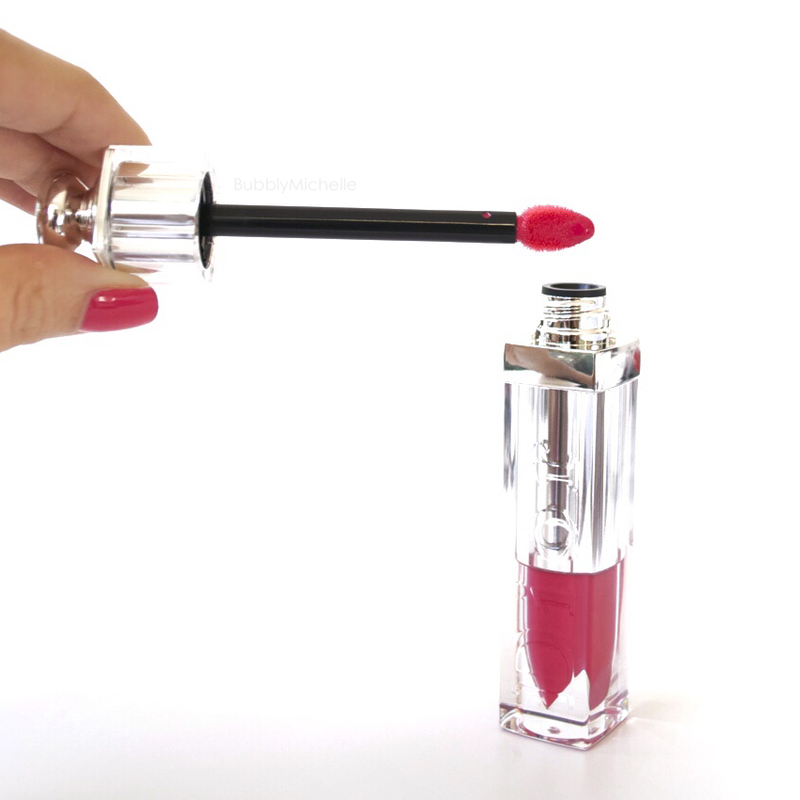 These Fluid sticks are supposed to be a hybrid between gloss and lipstick, promising vivid, pigmented colour with the added benefit of maximum shine. As always Dior nailed it with the packaging. 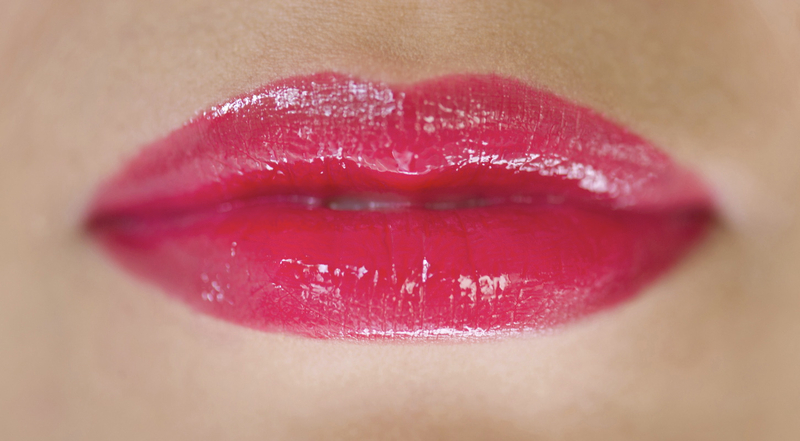 Which is what initially drew me to it.. A gloss encased in a lipstick shaped hollow? Just take my money! NOW! The applicator is of a doe foot type, soft and cushiony. It’s a tad wider than the usual doe foot applicators I’ve seen. Size wise it looks somewhat comparable to the YSL ‘s new Baby Doll Kiss & Blush applicator minus the little bead in the middle. I believe the bigger wand does make application easier if you have fuller lips and gives a smooth finish without ‘wand lines’ running across your lip. The formula itself is a nice consistency and has the ability to adhere to the lips, by this I don’t mean that they set, just that they don’t seem to move much after it has settled. 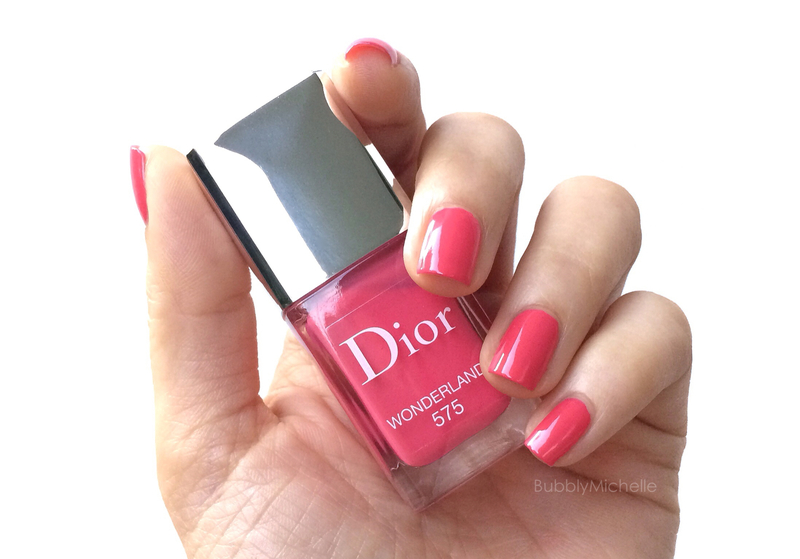 Here’s a swatch of 575 Wonderland! A close up shot with a macro lens so you get to see the moistness and all my lip lines! This Fluid Stick lasted close to 4 hours with a little fading, slight migrating and feathering around the lip line. Below a bunch of quick swatches I managed to get while at the counter 🙂 So if you are shopping online, hopefully these would help! 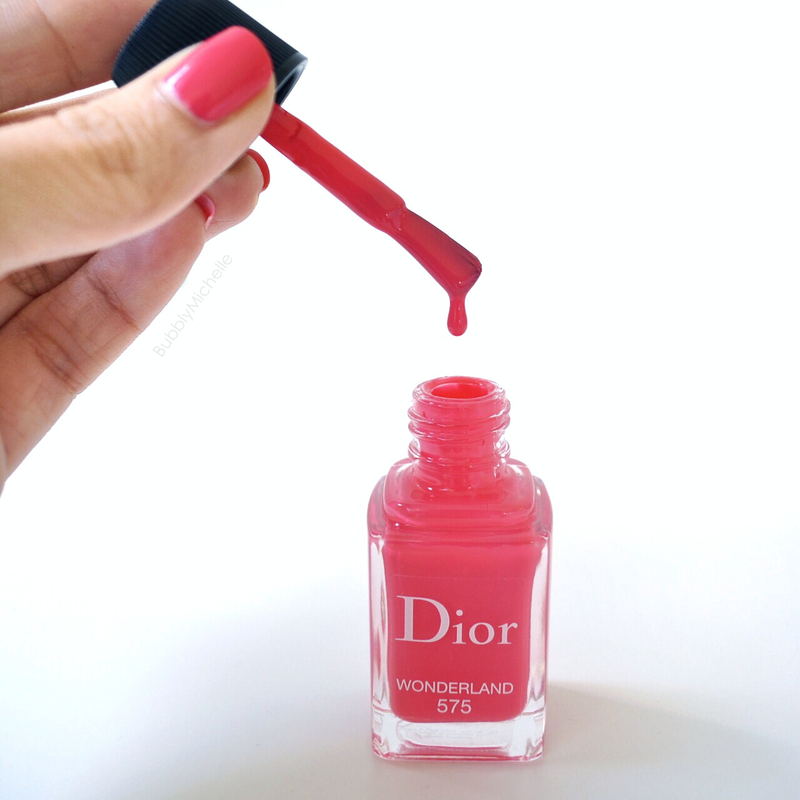 575 Wonderland nail polish is a bright medium pink shade; and depending on the lighting this can lean a tiny bit coral. The newly reformulated polish now goes by the name Couture Colour Gel Shine and Long Wear Nail Lacquer and is said to give a smoother finish and as the name implies, longer wear. I found that the brush of this is less dense than the usual Dior brushes and is slightly slimmer. The extra flexibility allows for a nice neat finish and I do like it more than the old version. As far as the products consistency goes I found this to be slightly runnier. I am not sure if the other shades perform the same but I will keep you updated when I try out Aventure soon 🙂 Usually just two coats of Dior is good enough for me, but with the thinner consistency I had to do 3. Here’s what it looks like applied. Three coats over a base coat (Skipped top coat so you can see it’s actual finish). I really love the glossy finish of this. And the final result is pretty neat and looks good. All thanks to the lovely wand! Do I think either product is a must have? the answer is no. However it would be nice to own them. All even >.< These pretty nail polishes look lovely colour wise, but I don’t see any major changes in the formula. Hopefully the wear would wow me, let’s see. These wore up to 5 days with minimal tip wear! Impressive! But that being said, I fully intend to pick up a back up of Wonderland nail polish cos I love the colour so much! I purchased mine at the Tangs beauty department in Singapore. The Fluid Sticks and nail polish retail for SG$47 & SG$38 respectively. oh Fiona helped me too… she’s super nice!!! But having said that, i totally agree with you on how there seems to be limited shades with those fluid sticks. I mean, they all seem to be some varying shade of red, and yes a couple of pinks but they are either super reddened pinks or baby pinks that make me look like death’s kiss. Why can’t they have some nice in between pinks that arent brown? These are really nice swatches. Thank you. I’m jealous; America isn’t getting 689 and 699 at this time and those are the ones I want the most. Hi Michelle, what is the name of the 699 shade? I can’t find it anywhere. The only one I can find is 669. Thank you for pointing that out or I would have never caught it! I had to zoom into the label to see what happened! But I just fixed my error on the swatches too soo! So yay!